CORE by DPA is a powerful new technology at the heart of our d:fine™, d:screet™ and now our d:vote™ series of miniature microphones. We’ve minimized distortion across the entire dynamic range. You will experience increased audio clarity and openness. 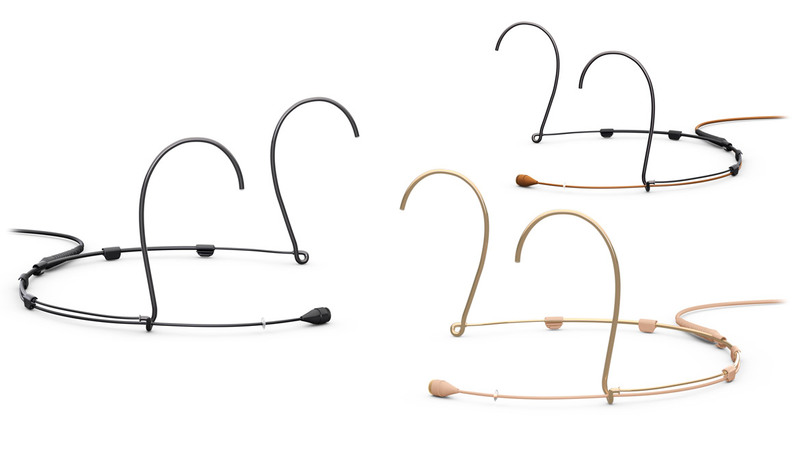 CORE by DPA is available for select models of d:screet™ Miniature Microphones and d:fine™ Headset Microphones Series and d:vote™ Instrument Microphones. 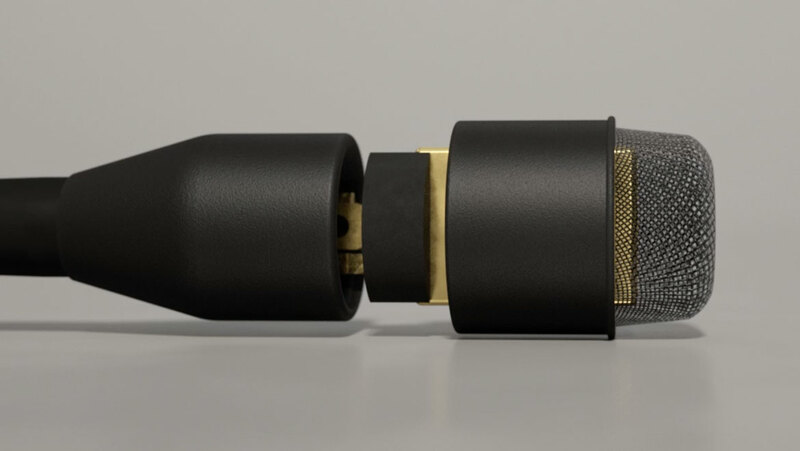 CORE by DPA makes our miniature microphones even better. CORE by DPA increases the dynamic range of our miniature microphones up to 14 dB depending on the specific type of capsule. An increased dynamic range and less general distortion means the sounds you capture come through loud and clear. From a whisper to a scream (Pianissimo to Forte), CORE microphones exhibit increased clarity and increase openness in the sound across all SPLs – from low to high. 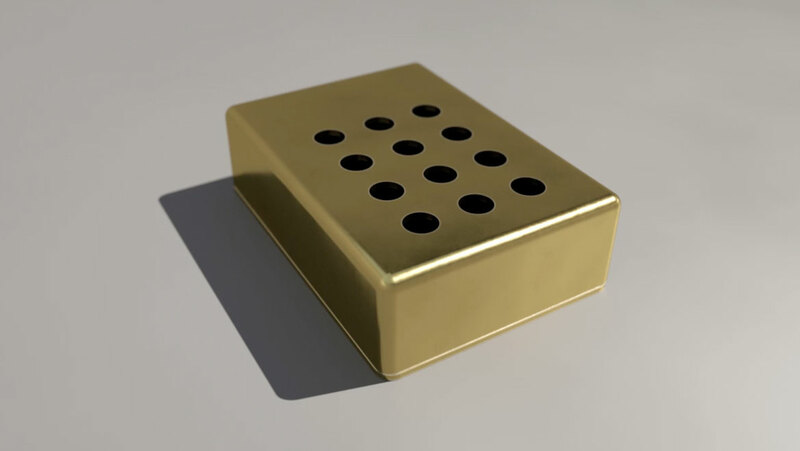 Looking for sound close to our original, amazing d:dicate™ 4006 in a miniature package? Check out CORE by DPA. We can’t promise quite the same sound, but it is very close. 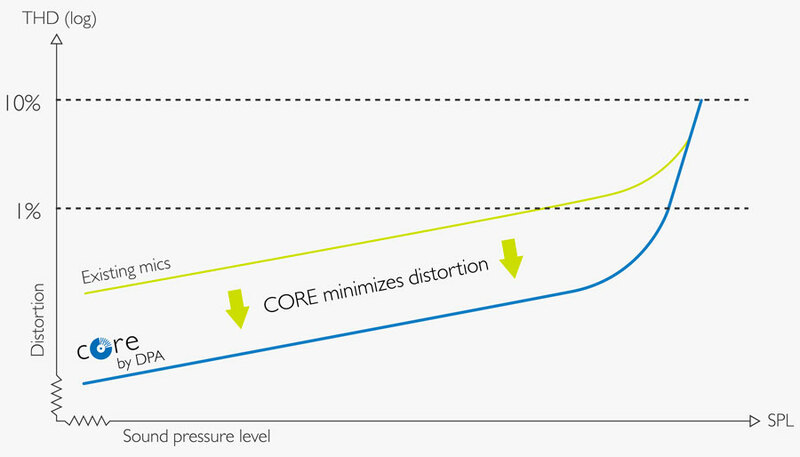 With CORE by DPA the d:vote™ 4099 gets an increase of up to 14 dB in both THD and dynamic range. With the CORE by DPA the d:screet™ 4060 series gets up to a 14 dB increase in both THD and dynamic range. d:screet™ CORE 4060 for Normal SPL - 6 dB increase in THD and dynamic range. With the CORE by DPA the d:fine™ 4066, 4088, 4266 and 4288 gets a 14 dB increase in both THD and Dynamic range. WHO SHOULD CHOOSE CORE by DPA? Anyone looking for the BEST achievable sound on the market should choose CORE by DPA as it provides consistency, clarity and amazing speech intelligibility in any application. Three applications where CORE by DPA stands out as a necessity are for film recording, theater and the live music scene. In the film recording industry, CORE by DPA can potentially save the sound crew a lot of time, effort and money. DPA microphones are known for their ability to withstand expressive acoustical sound pressure levels (SPL) without distortion and now CORE by DPA minimizes distortion even more. With such a large dynamic range, one microphone can be bodyworn on an actor that needs to whisper in one scene and scream in the next. Similarly, theater applications often also need to capture wildly varying SPLs with one bodyworn microphone. In addition, when there are 30 or more mics on the stage, the clear and open sound of CORE by DPA will brighten the entire sound picture. In the music industry, every musician, live sound engineer and rental house striving for the best stage mic solution should consider a d:vote™ 4099 with CORE by DPA. This updated version of the d:vote™ adds more clarity and brings out more details across the entire dynamic range. The original d:screet™ and d:fine™ microphones are both based on the same DPA capsule technology – they have been, and still are, some of the most clear, consistent and robust miniature microphones you can find on the market. The original d:vote™ Series is already the recognized standard for this type of microphone and the CORE by DPA version adds just another layer of sound quality that further distances this mic from its competitors. All three of these microphone series have always been known for working across a wide dynamic range as well as exhibiting low distortion across all SPLs. This will allow them to be used in such applications as outfield grass and the turf on pitch and gridiron. 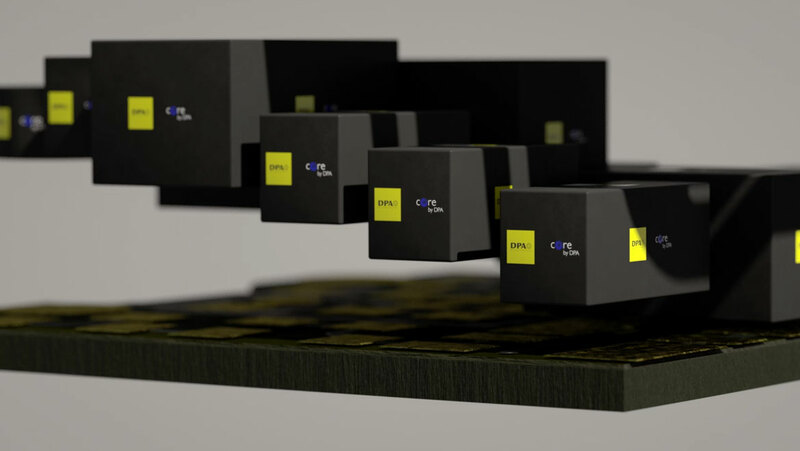 All microphones purchased with the new technology will come in ‘CORE by DPA’ packaging. 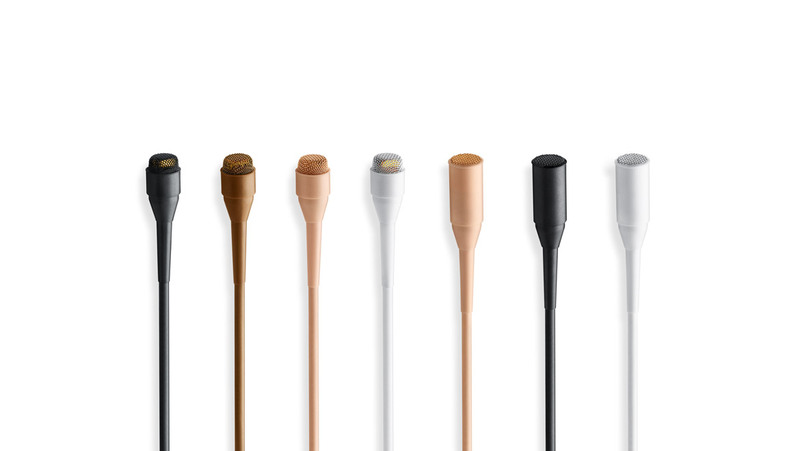 The d:fine™ and d:screet™ mics with CORE by DPA will have a blue label near the serial number on the cable to differentiate between these and the original versions. These mics will also have a very discreet laser engraving stating ‘core’ at the microphone capsule as well. The remaining d:screet™ and d:fine™ microphones and full range of color options will be available in CORE by DPA versions in early 2018. The d:vote™ CORE 4099 mics will sport a completely new streamlined design and we have added a blue ring at the cable exit to the rear of the windscreen. 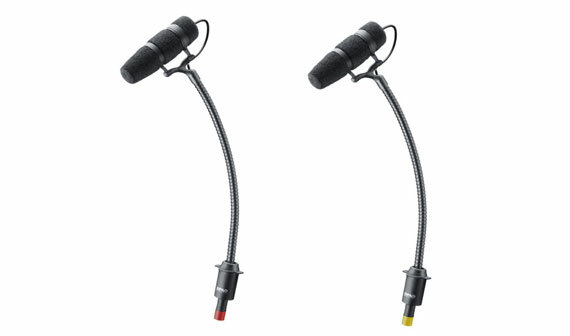 In addition, there will be color-coding at the cable end of the gooseneck so you can easily identify the two versions of the mic. This identification is almost invisible in use due to the mic placement on an instrument. Dynamic range is the range of sound pressure that a microphone can handle. It is measured from the SPL at the noise floor (the mic’s own self-noise) to the SPL at 1% Total Harmonic Distortion (THD). 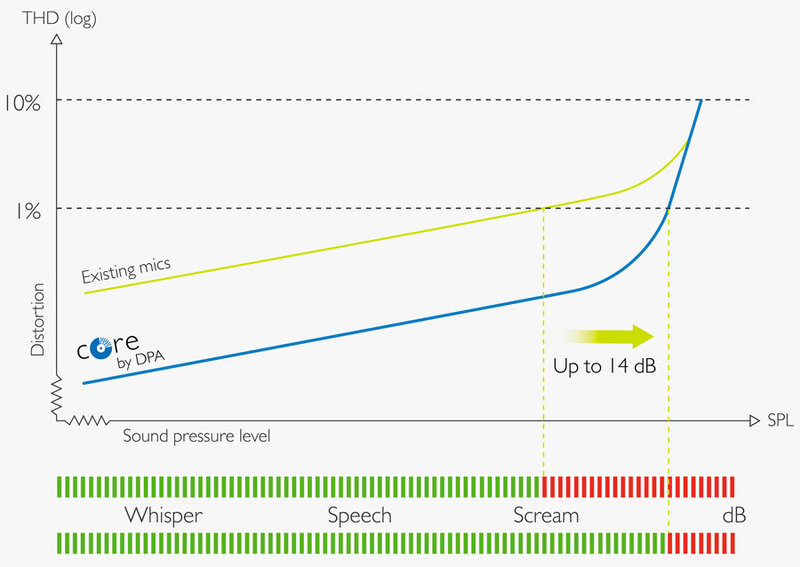 At 1% THD, most people listening will be able to detect a change in sound quality. For more information about dynamic range, THD and other important microphone specs, read our Mic University article on the subject. A walk through some of the most important microphone specifications and how they are derived.